Not at all what I had thought I’d write about. I had thought more along the lines of getting acquainted with me, your blogger. By way of introduction, quasi-bio, to develop and establish our blogosphere friendship. The death of a cherished friend this week decided for me. It’s not easy to quantify any friendship, sometimes there’s just a connection, and this friend was that to me. And, I pray, I to him. We shared some deep commonalities, writing among them. 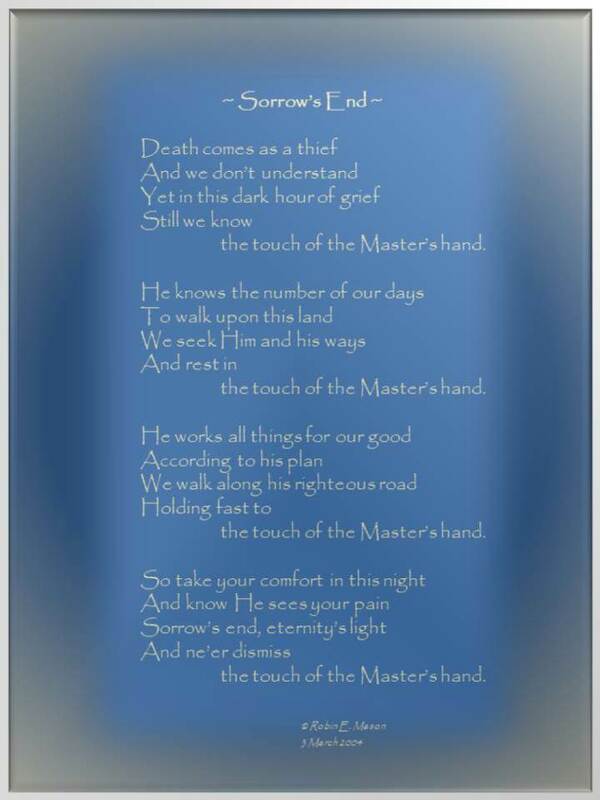 Death, whether sudden or anticipated, is never an easy companion. Aged grandparents who go in their sleep or after long-term health issues is a painful loss, and no matter how we “prepare” we are never ready. Sudden and wretched tragedies we certainly are unprepared for, and perhaps it’s more difficult to process, accept. Traffic accidents, war, suicide, physical violence, abuse, both physical and substance – how do we justify? How do we cope? I know I have a Savior Who holds me in the palm of His hand, Who gives peace when there is none. I have that peace, as I write, I am at peace. And yet I struggle, did I convey adequately my love, my friendship? Did my friend die with at least the knowledge of my devotion? In his final moments, probably he would not think of me – how selfish am I??? In his final moments, I pray he was thinking of Jesus, ready for His embrace. There is my peace, there is my hope, for the day I will see my friend again. I woke up yesterday, and again today, and couldn’t believe my friend was gone. I can’t call him, can’t instant message him, can’t pop into his office to playfully harass him anymore. And I can’t process. Not yet. We, all who knew him, there’s a hole in our collective hearts. We are numb. While we struggle through the days ahead, and the months to come, with our friend gone, we also have something the rest of the world doesn’t. We knew him, we counted him as a friend, brother, father. We had the privilege of knowing him. That is now an elite privilege. What I can do is dedicate this blog to him. What I can do, as his friend, is honor his memory, to continue to live as his friend. A part of me died with my friend – and a part of my friend lives on in me. In all who were friend and family to him. In friendship’s take and give, like dye in water, we take on part of one another. Sam colored my life with kindness, an enigmatic (and very cute) smile, gentleness, with intellect, encouragement, laughter. These I keep, these I treasure, and for these I am truly blessed to be counted as his friend. And that’s forever. Four techniques to take your story to the next level. No, really, I had to make myself stop reading. And only because I had to sleep n stuff. Ms. Dotta’s writing is reminiscent of Jane Austen. 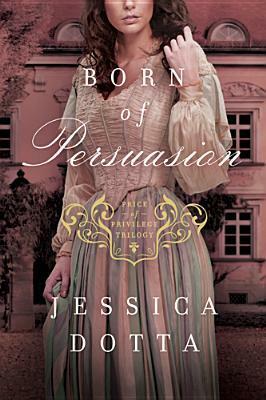 Set as contemporaries of the likes of Elizabeth Bennet and Elinor Dashwood the reader is immersed in the throes of Julia’s plight, that she is a woman in a time when women were property. Julia’s fight for happiness runs through the whole of the story, as she faces first one opposition and hurdle, then another. The twists and intrigue to this story will keep the reader on the edge of his or her seat. Mrs. Windham could be the sister of Jane Austen’s Mrs. Bennet. Elizabeth is quite the proper young woman, at least when she’s around her mother. Edward and enigma, Mr. Macy more so. Wounded by deep scars from her childhood and by current tragic events, Julia struggles to gain footing and confidence – at least, as much as a lady in her era can know – and to find love and happiness. I am enamored of Ms. Dotta’s writing, and will be sure to read the second and third books in this trilogy, Mark of Distinction and Price of Privilege. I look forward to reading many more by this author. only ‘cept it’s Saturday… So, I missed my Blog Day. So, crucify me…..
Ohhhh….. Crucify. That reminds me, anybody remember Who was crucified yesterday? Well, yesterday about 2000 years ago. Yeah, Jesus, that Dude. And does anybody remember why? Well, THERE’S a can of worms. Why was Jesus crucified? ‘Cause He was such a hardened criminal? Nah, don’t think so. ‘Cause He was subversive, committed all manner of white collar crimes? Wait, they didn’t even wear collars back then. Was He a liar, a petty thief? What did He do that was so horrific it warranted death? And not just a quick little ol’ lethal injection or a current of mega volts. No, He suffered one of the most inhumane and torturous deaths ever invented by man. Which begs the question, why would anybody want to crucify someone for loving them? How much sense does that make? What was WRONG with those people? It wasn’t the people who were reacting. No person in their right mind is going to reject love, let alone kill someone for it. Yes, I’m talking about the devil. Remember him, from the Garden of Eden? Yeah, same despicable slimy character. Telling the same lies to anyone who will listen. See that? … to those who will listen? See, he’s subtle. He starts with niggling little questions. Like, did God really say that? Are you sure you’re really saved / healed / blessed / fill-in-your-own-doubt? When God says I’m a princess, the enemy comes back at me with, “Look at your rags. You’re no princess, you’re just a Cinderella. You’ll never be worth anything. You’re nothing but a failure…..” [and yes, that was what he threw at me for years] No wonder I couldn’t accomplish anything! No wonder I didn’t know, couldn’t identify, who I am in Christ! I mean, didn’t He say to His Father regarding those who put Him up there, “Forgive them.”? And that’s what the enemy doesn’t like. That’s what the enemy has tried from the beginning of time to destroy. And that’s what he just doesn’t get. He can’t destroy it. He’ll come at us in a million ways, but he can’t destroy the love of God. The Pharisees and religious rulers of the day didn’t get that. They believed a set of lies the enemy had sold them. They were all about rules, but they had no love in their hearts. The devil played them, and they carried out his scheme. But it didn’t conquer God. And it didn’t make the devil king over nothing! God is still Lord of lords and King of kings. And the devil is still nothing but a liar and a thief. It’s our choice, we get to align ourselves with the devil, and his lies, or with Papa God, who loves us – and died to prove it. The enemy will never offer a relationship, he pretends to be a friend but he’ll bail every time. Jesus stands at the door and knocks, waiting for us to invite Him in, waiting patiently I might add. His is the sweetest most sincere friendship you could imagine. I know, He’s my best friend. And that’s why He was crucified. So I could be His Princess and friend. Since the release of Tessa, I have sought to broaden my writer’s presence. I have joined writer’s pages and groups, I have subscribed to other author’s pages. I started a blog and revived another one, and this robin bird finally decided to tweet. It’s all about shouting to the world, “HEY! Look at me!” So, HEY, lookie here, look at me! And I’m overwhelmed. Let me explain a little something about me. I’m a wee tad bit OCD. I know myself, if I started following blogs, I’d have to read each and every post, so I’ve avoided it. Same with Twitter. [truth be told, I was that way with Facebook until recently] There’s just not enough hours in the day, or a lifetime to keep up with it all. OVERLOAD!!! Warning, Will Robinson, danger. And yet, here I am, blogging. Yippee. It’s not that I don’t enjoy it, ‘cause I do. I know at first I wasn’t sure what to say, but that’s not true. I’m a writer, there’s never nothing to say. Ever. EVER. So, now you know. I’m learning to swim. And I think my feet are touching some sand in the murky waters, and I’m starting to wade through this media panoply. Can’t make promises, not yet, gotta get the rhythm of it yet, but my goal is to post a new blog at least once a week, to introduce myself. That and write my stories. “Tessa flopped onto the divan, more worn and weary in her thirty-seven years than the faded and threadbare divan in its 137 years. What will I tell the others, she moaned to herself, too weary even to weep at the events of the past thirteen days. 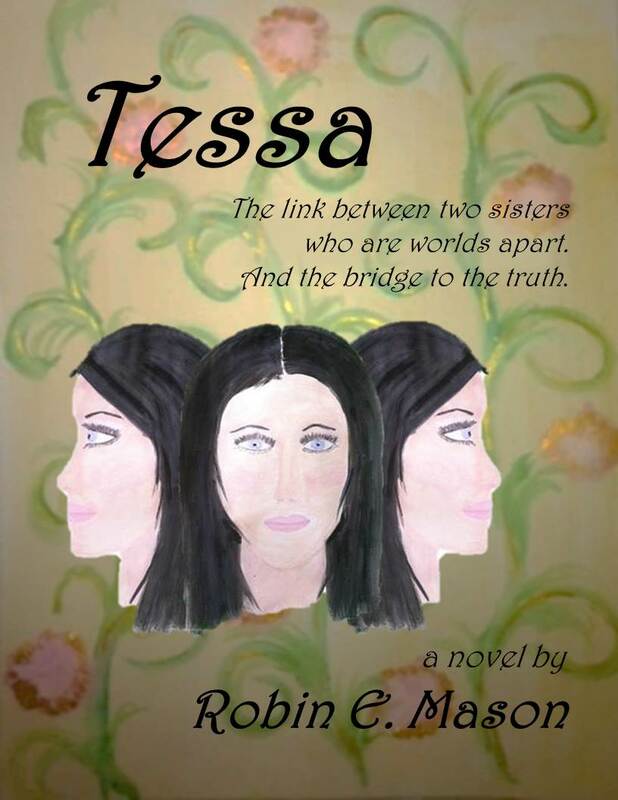 TESSA, available now on Amazon Kindle! !